“It’s my understanding that what we’re approving here is a site plan, not the type of tenants that might live in this apartment building,” said Aurora Mayor Bob LeGare following the introduction of Agenda Item 12A. LeGare spoke at a September public hearing in support of the Providence at the Heights (PATH), an affordable housing complex that the Aurora Planning and Zoning Commission had unanimously shot down in July. The appeal was submitted by Second Chance Center (SCC), a non-profit organization with a mission to provide rehabilitative services for formerly incarcerated individuals. A 6-0 decision of the Planning and Zoning Commission denied SCC’s proposal for a new supportive housing complex. PATH would be a three-story, 50-unit, multi-family apartment complex providing affordable housing for SCC’s clients, as well as other individuals earning at or below 30 percent of average median income, who are homeless or at risk of becoming homeless, or who have a disability. The site, on the southwest corner of Aurora Parkway and Joplin Street, shares space with neighbor Elevation Christian Church, sitting on a vacant portion of the church property. 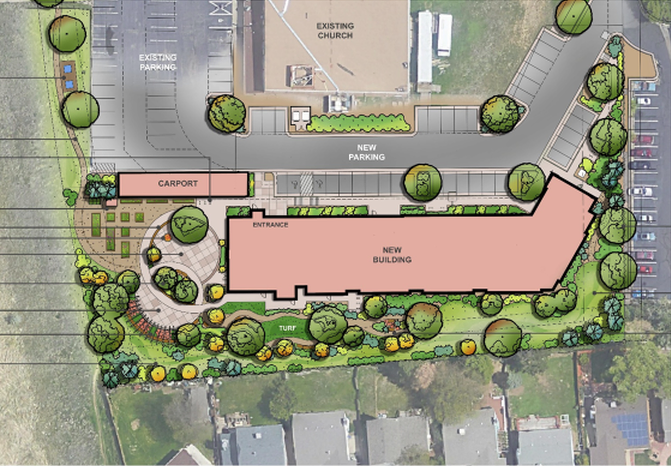 When the project was denied, the commission cited concerns about parking space — SCC had arranged a shared parking agreement with Elevation — and size of the site. Seventy-three council meeting attendees submitted speaker slips in order to address the item during the public hearing over the decision. PATH is just one part of a larger campaign for affordable housing started by SCC. SCC leases apartments at South Valley Highway in Unincorporated Arapahoe County through a partnership with Unlocking Equity, as well as a quad plex located at Chambers and 13th. Plus, SCC is partnering with Interfaith Alliance to encourage other churches to make open space on their properties available for affordable housing development. “A fact we’re very proud of is that we’ve never had a negative police contact at any of our sites,” said Latif. Beyond providing residents with physical necessities, SCC aims to give them the confidence required for rehabilitation. Second Chance Center’s original vision for PATH was that the complex would provide housing exclusively for SCC clients. However, when the organization learned of challenges to acquiring Low Income Tax Credits, it expanded resident identification to include other demographics, such as the impoverished and disabled, in order to have a more competitive funding application. Plans released by the Second Chance Center for its PATH project, which will share property with Elevagtion Christian Church. Under Aurora’s building and zoning code, there are 11 criteria for approval of a site plan, none of which the Planning Commission identified as concerns in its initial decision. “What one sees in reviewing the Planning Commission meeting minutes is that the bulk of the time — the bulk of the public comment and the bulk of the commissioners’ comments — focused on considerations that are not legally relevant to the site plan approval criteria or the waiver criteria,” said Munsey Ayers from Ottten Johnson Robinson Neff + Regonetti Law Firm, the firm representing SCC. “We looked for nine months for something — land that was available — that was zoned appropriately for multi-family housing. When we finally connected with Elevation Christian Church and saw the site, we knew right away that there were changes we needed to make — alterations — we never wanted to be invaders, we always wanted to be neighbors,” said Latif. Following a motion by Council Member Crystal Murillo to approve the site plan with two waivers, and a second by Council Member Allison Hiltz, the council voted 6-5 in favor of approval. Latif hopes the developers will be able to break ground Nov 15. They estimate it will be 13 months from that date when SCC can start leasing, putting the official opening of PATH in Dec 2019.